What is Java BeanUtils Tutorial? The Java BeanUtils are the components of the Apache Commons that are derived from JavaAPI and presents component architecture for the Java language. 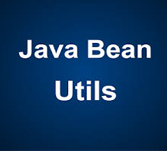 The Java BeanUtils design patterns makes use of utility classes that helps to get and set the property values on Java classes for retrieving and defining the bean properties. This tutorial covers most of the subjects required for a simple understanding of Java BeanUtils and to get a feel of how it works. This tutorial has been prepared for the beginners to help them understand the simple to advanced concepts related to Java BeanUtils. Before you begin practicing various types of examples given on this reference, we assume that you are already aware about computer programs and computer programming languages.